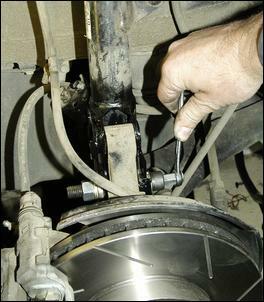 Camber adjusters which are fitted at the bottom of the strut rely on the fact that just two bolts are used to connect the strut to the casting that supports the stub axle. 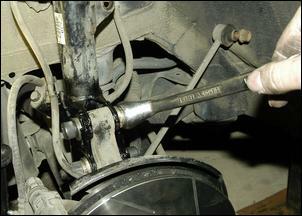 If you move the top bolt towards the centreline of the car, or the bottom bolt outwards, negative camber will result. So let’s take a look at fitting a camber kit – in fact, we chose to fit two full kits. So why two? Well, read on! We used two K-Mac camber kits. 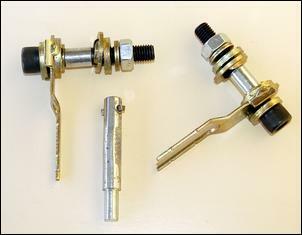 These kits use full-size replacement bolts rather than the smaller diameter, crank-offset bolts used in some kit designs. (Well, that’s not entirely true, as we’ll come to later.) Each kit costs AUD$130 direct from K-Mac. 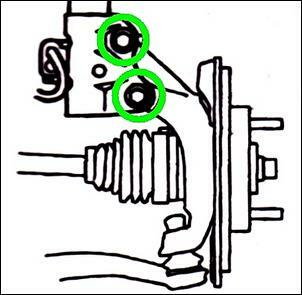 This diagram - from the car’s workshop manual - shows how two bolts locate the wheel assembly with regard to the strut. 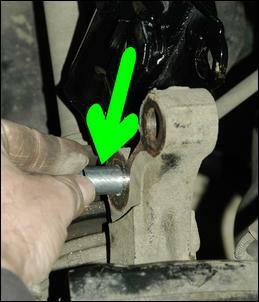 It’s these bolts (circled) which are replaced by the camber kit. Normally, just the top bolts on each side are replaced but to get maximum adjustment, we used two kits and replaced both top and bottom bolts on each side. Here’s what one of the new bolt assemblies looks like. From left is the new bolt – note the flat machined along the entire length. 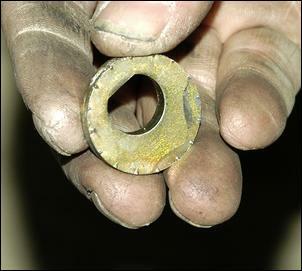 Next is an eccentric washer – it’s important to firstly note the hole is ‘keyed’ to match the cross-section of the bolt, and secondly that the hole is not located in the middle of the washer - ie it’s eccentric. Next is a guide-plate with a slot built into it, followed by a bush, a slotted washer, a non-eccentric washer, two more washers (sitting on top of each other) and a nut. Confused? It gets clearer in the next pic. You can see from this ‘assembled’ view that the eccentric washer sits within the slot in the guide-plate. 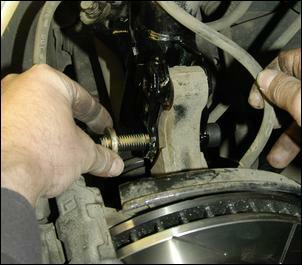 If the bolt is turned, the eccentric washer bears against the plate, causing the bolt to move laterally within its slot. Now that’s just what we want to change the camber – a laterally moving bolt in the lower suspension assembly. So if the guide plate is fixed to the lower strut assembly, and if the bolt passes through the wheel support casting, then turning the bolt will wind in or out camber. 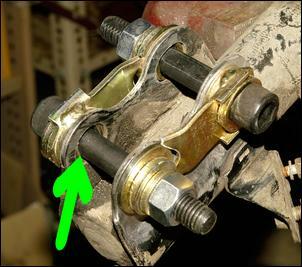 And if we replace both upper and lower bolts, we’ll be able to get double the amount of adjustment. Here’s a complete K-Mac camber kit. 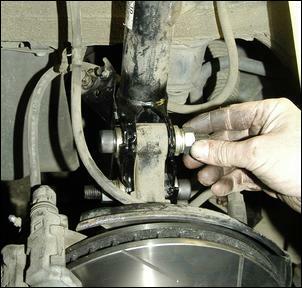 There are the two bolt assemblies and also a drill-bit designed to enlarge the holes in the suspension strut so that the slotted washers (one integrated into the guide-plate and the other at the other ends of the bolts) can be fastened to the strut. The holes can be drilled with the strut assembly still on the car – you just undo one bolt sufficient to pivot the other holes out far enough to do the drilling. However, for reasons that will soon become obvious, we chose to do the work off the car. That meant the top strut retaining nuts needed to be undone, the bottom pair of bolts undone and the sway bar disconnected. 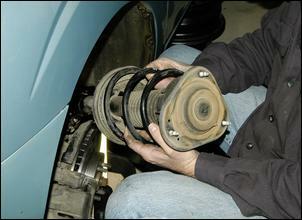 With some undoing of brake line and ABS cable retaining brackets, the strut could then be removed from the car. Note the arrow drawn on the strut top (above) so that the correct orientation was again easily found when it came time for re-installation. 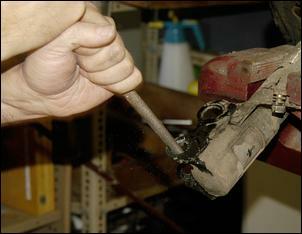 The provided K-Mac drill-bit fits into a normal portable drill. The holes in the channel section of the lower strut are drilled out – here the top hole has already been done and now the bottom hole is being enlarged. Note that when one camber kit only is being installed, just the top holes are drilled out. 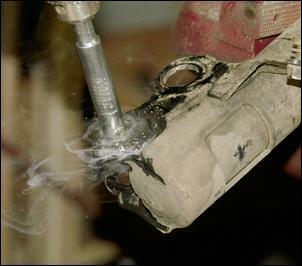 The drill-bit was lubricated with penetrating spray, explaining the smoke. The drill-bit, formed from a piece of tool steel forced at right-angles through a shaft, tends to break through unevenly and so leaves some edges that need to be cleaned-up with a round file. 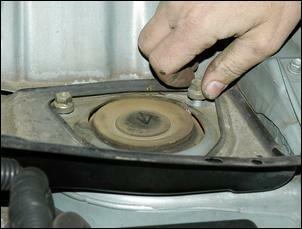 The guide plate can then be inserted into one of the enlarged holes. It has legs that extend over the other bolt, helping to keep the slot that’s integrated in the guide plate parallel with the road – that’s the direction the bolt needs to be able to move back and forth in when adjustment is being made. However, in our case, where camber kits were being installed in both holes, these legs were much too long so they were cut off short. Here one of the kits has been temporarily inserted and the other is being put into place (note the shortened legs on both guide plates). 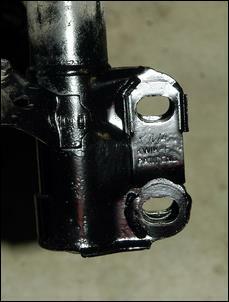 With the kits temporarily bolted into place, you can see the slot (arrowed) that the bolt moves along during adjustment. 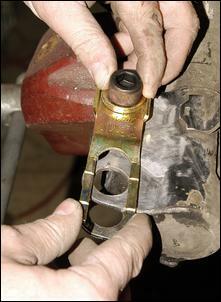 At the arrowed end, the slot is held in the right orientation by the legs, but at the nearer end, the slot is prevented from turning only by the clamping force of the nut. Further, the slotted washers, which sit in the enlarged holes on small shoulders, aren’t all that well located. 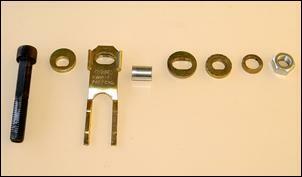 A much stronger assembly would result if the slotted washers were welded to the strut bracket. This would: 1) strengthen the area weakened by the enlarging of the holes, (2) prevent any possibility of the slotted washer rotating, and (3) prevent these washers slopping around within the holes. So welding is exactly what we did. You can see how the slotted pieces of steel are now strongly held in place on the strut bracket. The shoulders on the back of these pieces are meant to be a push-fit in the enlarged holes – but as we said above, the fit often leaves a bit to be desired. 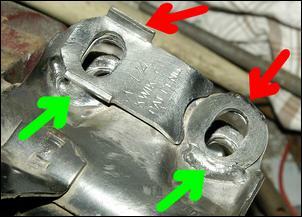 The welding was done on both sides – the closer welds (green arrows) and also on the side furthest from the camera (red arrows). A local welder charged AUD$30 to do the job with arc welding. After being cleaned-up with a wire brush and then painted black with a spraycan, here’s what the lower strut assembly looked like. 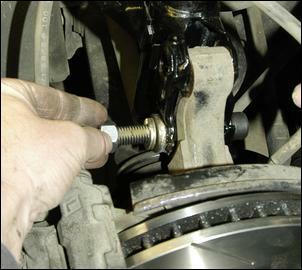 Note the slots parallel to the road along which the bolts can move during camber adjustment. 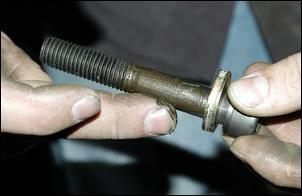 ...the bolt should be lightly smeared with anti-seize compound. 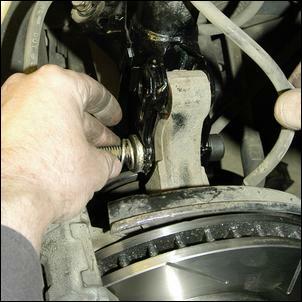 Before going any further, and with the nut only finger-tight, rotate the camber adjustment bolt and make sure that you can see the hub assembly moving in and out. If it doesn’t, you may have inadvertently swapped the eccentric D-washer for the non-eccentric D-washer. (We speak from experience!) 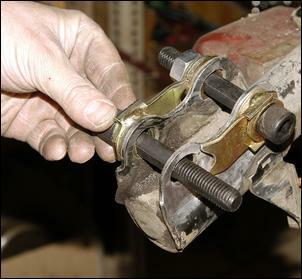 Note that a small hex-extension is provided so that the recessed hex-head bolt can be turned with a normal 12mm spanner. 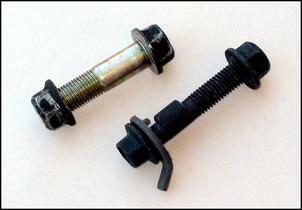 If you are using two complete kits, the other camber adjustment bolt assembly can now be installed. If you are using only one kit, the normal factory bolt goes back into the other hole. To get the car down to the wheel aligners, adjust the bolts so that the eccentricity of the washers shows that they are centred in their slots. This should give near-factory camber - anyway, sufficiently accurate for a short trip to an alignment machine! 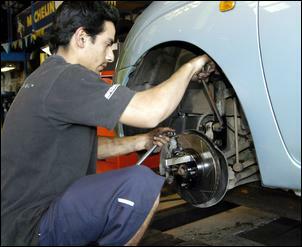 Make sure that when you book-in the car you tell the alignment company that you have a camber kit installed. (Some aligners consider an alignment to be a toe setting alone!) 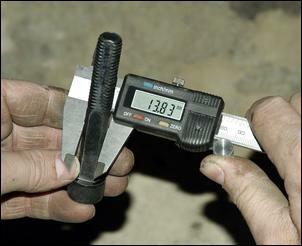 On this car the maximum camber (with both bolts being adjusted) proved to be about 2.5 degrees negative on one side of the car and 1.7 degrees on the other. 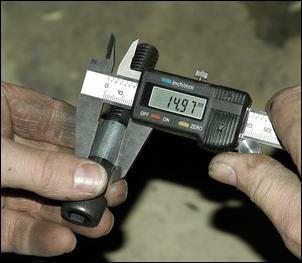 We had the camber set to 1.7 degrees each side, with a total toe-in of 4mm. The alignment cost AUD$44. The resulting camber is visually able to be seen – the front wheels are leaning in at their tops. This much camber should be used where previously outside shoulder tyre wear was noticeable – that is, the car was working hard those areas of the tyre. 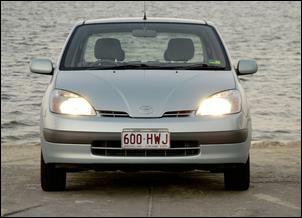 In this car, a Toyota Prius, the alignment change resulted in much less understeer and better steering feel, the latter especially noticeable in high speed sweepers. However, the downside is that if the car is driven gently, more tyre wear will occur on the inside of the tread. 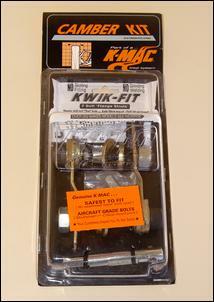 One of the two camber kits used in this story was provided free by K-Mac. 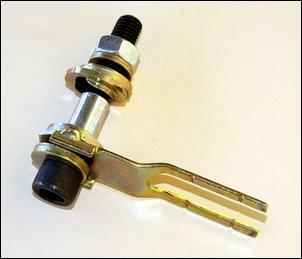 Many camber adjustment kits replace the factory bolt with a smaller diameter unit that incorporates an eccentric – as shown here. K-Mac makes much of the fact that they don’t use undersized bolts of above type in their camber kits. “Your customers expect you to sell safety. 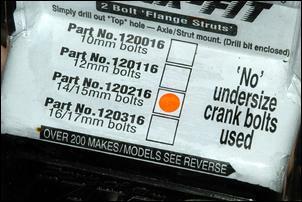 No undersized crank bolts” say their literature that’s directed at workshops. Trouble is, in the case of the 15mm bolts standard on this Toyota, the provided K-Mac bolts actually are undersized – they’re 13.8mm. That’s why the bushes are provided.